At Unity College we seek to build a safe, caring and positive community. We use an approach called Restorative Practices that acknowledges that healthy relationships are essential for our lives, our learning and our community. All staff and students are expected to be supportive of, and participate in Restorative Practices when they are involved in a conflict, complaint or issue of concern. 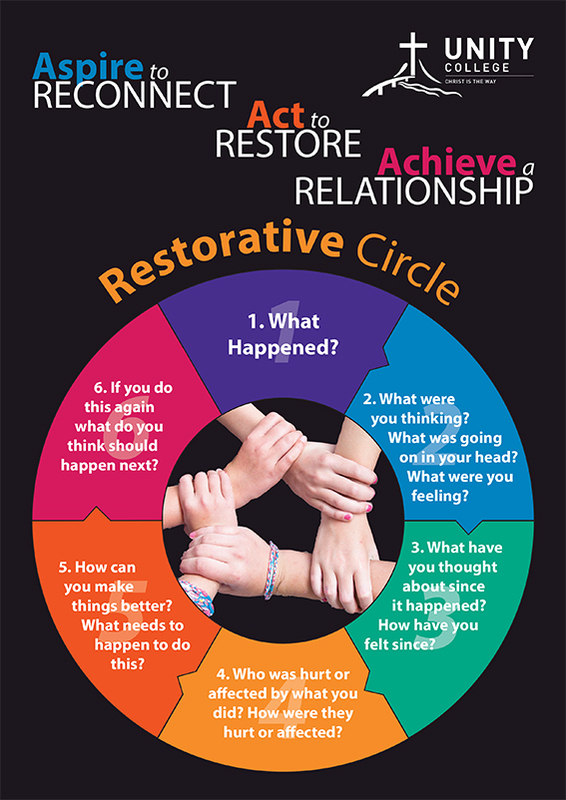 What Does a Restorative Practices Approach Mean? It is an approach to behaviour management and discipline that emphasises the importance of relationships and is a way for students to develop better understanding of and empathy with others. The restorative Practices approach creates opportunities for those involved in a conflict to work together to understand, clarify and resolve the incident and work towards repairing the harm caused. With Restorative Practices at Unity you will hear staff and other members of the community using the language outlined in the ‘Unity Restorative Circle’. Feels he or she has been unfairly treated. *Please note: In issues relating to sexual harassment/abuse, the College Child Protection Policy will be followed.